I had the opportunity to evaluate one of the "PowerNuts" by Jacobs. It came in easy to access packaging. I think we've all fought trying to get the product out of the packaging before. You could actually store the nut back in it, but I'm sure most will leave it on their grinder. This particular nut fits most grinders using a hubless disk. When using a standard grinder disk, you use the Powernut with the backflange that comes with your particular grinder. When using an abrasive disk you use the provided Jacobs backflange. As you can expect, the directions that come with the Powernut are very straightforward. The nut is simple to install. Just remove your existing nut, if you are using a grinding disk, then use the back flange that came with your grinder. Install the disk, then screw on the PowerNut. 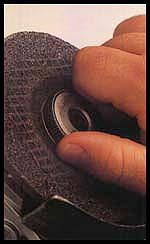 If you are using a flexible abrasive disk with a flat back then use the supplied Jacobs Back Flange to support the disk. To remove, simply hold the disk and grasp the knurled nut and unscrew. I used the grinder repeatedly on a small project I had. The nut never backed off nor even siezed. It unscrewed quite simply every time. No product is without some drawback. The provided backflange is liable to get misplaced unless you pack your grinder away in its case every time or put the flange away in a safe place. It would be a nice touch if Jacobs came up with a method of securing or holding the backflange to the cord. Sort of like a rubber chuck key holder that dangles from the cord only where you could undo it and redo it as necessary. The other potential drawback is running the nut against whatever you are grinding and rubbing the knurl off or jamming the nut to the threaded hub. Time will tell on this one. Suggested Retail price on the large PowerNut (7"+ wheels) is $29.99. The Smaller Powernut (4"-5" Disks) runs $14.99 but worth it if you go through alot of disks or have "lost" or "misplaced" the wrench when you need it most, in the middle of a project. Please feel free to contact me if you have any questions. As I use it more, I'll post an update. The Jocobs Powernut is a replacement nut for holding grinding wheels and accessories on small angle grinders. I have a Dewalt (DW-400) 4 1/2" angle grinder. The angle grinder, at least in my shop, gets all the dirty jobs. It is an aggressive, dirty, even scary little machine to operate and I never use it without wearing safety glasses and leather gloves. So when I change grinding accessories whether it be sanding disk, metal grinding wheel, or the handy dandy "chain saw-on-a-wheel" attachment, I'm pretty careful to see that everything is in proper alignment and tight. I do not want one of these things flying off in the middle of an operation. Now, the PowerNut's one claim to fame and usefulness is that it tightens and untightens without the use of wrench. I first tried the nut with the standard type 27 grinding wheel. Admittedly, I was a bit nervous and held the machine at arms length and closed my eyes (now that's a real safety precaution) as I turned on the little beast. The wheel stayed on. I loosened it, fingers only, re-tightened, and proceeded to cut through a piece of pipe. There was no evidence of slippage and when done, the wheel was firmly in place. Based on this usage test, I was ready to state that the PowerNut works as advertised. I changed to a sanding disk for the next test. This would be a little different because (1) the sanding disk has no metal hub for re-enforcement and (2) the PowerNut is a bit larger than the original equipment. Calipers revealed that the PowerNut was almost 1/4" larger in diameter and almost 1/16" thicker than the original. Both concerns were put to rest as I ground off the end of a chair leg. Again the PowerNut held firmly and its additional size did not interfere with the sanding operation. At this point I announced the product a success. It accomplishes its mission nicely. Overview: Finally someone recognized our need for safely mounting those saw blades and cutting wheels with 7/8" holes to our 4 1/2" angle grinders. Not only does it work it requires no wrenches or pliers. Requirements: Grinder must have 5/8" 11 thread. Construction: The PowerNut must be made with internal clutches in order for it to be removed so easily. Overall:The PowerNut is a great addition to your grinder supply box. It enables you to quickly change wheels without searching for the wrench your buddy lost last time he borrowed it. Above all it is a safe method for holding those thin discs centered and true. Thumbs up and thanks Jacobs for thinking of our needs. I happened upon my PowerNut when one of the original responders found that the PowerNut wouldn't fit his grinder. Since no other member responded to my announcement that the accessory was available for evaluation, I decided that I could bring myself to evaluate this accessory. Once in a while, a product comes along which provides a solution to a vexing problem. The PowerNut is such a product. Those of you who have used hand-held grinders know how aggravating it is to find that you've lost or misplaced the arbor nut wrench. With the PowerNut, one no longer need worry about a wrench as the nut is a single component which is easily installed and removed with minimal effort. Once the PowerNut is installed it stays put until the operator decides to remove it. Not much else to say about this ingenuous device . . . it works and works well.